Allaah -The Most High – said: “The month of Ramaḍaan in which the Qurʾaan was revealed, a guidance for mankind and clear proofs for the guidance of the Criterion between right and wrong. 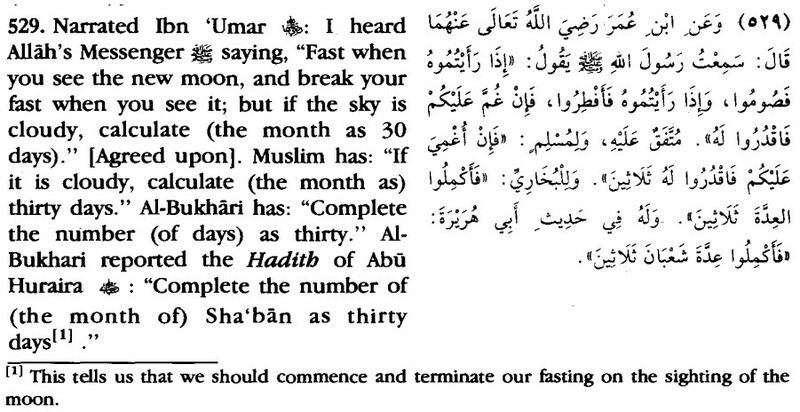 So whosoever of you sights the crescent for the month of Ramaḍaan, he must fast that month.” [Soorah al-Baqarah, 2:185]. Fasting has been legislated in order that we may gain taqwaa as Allaah – the Most High – said: “O you who believe! fasting is prescribed for you, as it was prescribed upon those before you in order that you may attain taqwaa.” [Soorah al-Baqarah 2:183]. “This is one of the best definitions of taqwaa. For every action must have both a starting point and a goal. And an action will not be considered as an act of obedience, or nearness to Allaah unless it stems from pure eemaan (faith in Allaah). Thus, it is pure eemaan – and not habits, desires, nor seeking praise or fame – that should be what initiates an action. And the preparation showed, to earn the reward of Allaah and to seek His good pleasure.” So Fasting is a means of attaining taqwaa, since it helps prevent a person from many sins that one is prone to. Due to this, the Prophet (ṣallallaahu ʿalayhi wa-sallam) said: “Fasting is a shield with which the servant protects himself from the Fire.” So we should ask ourselves, after each day of fasting: Has this lasting made us more fearful and obedient to Allaah? Has it aided us in distancing ourselves from sins and disobedience? So drawing closer to Allaah – the Most Perfect – in this blessed month, can be achieved by fulfilling one’s obligatory duties; and also reciting the Qurʾaan and reflecting upon its meanings, increasing in kindness and in giving charity, in making du‘aa (supplication) to Allaah, attending the Taraaweeḥ Prayer, seeking out Laylat al-Qadr (the Night of Power and Pre-Decree), a night which is better than a thousand months, attending gatherings of knowledge, and striving in those actions that will cause the heart to draw closer to its Lord and to gain His forgiveness. Our level of striving in this blessed month should be greater than our striving to worship Allaah in any other month, due to the excellence and rewards that Allaah has placed in it. Likewise from the great means of seeking nearness to Allaah in this month is making I‘tikaaf (seclusion in the mosque in order to worship Allaah) – for whoever is able. “O Prophet, urge the Believers to fight … So if there are one hundred who are patient, they shall overcome two hundred; and if there be one thousand, they shall overcome two thousand, by the permission of Allaah. And Allaah is with the patient ones.” [Soorah al-Anfaal, 8:65-66]. Thus, in this blessed month we can sense an increased feeling of unity and of being a single Ummah due to our fasting and breaking our fast collectively. We also feel an increased awareness about the state of affairs of the Muslims and of the hardships that they endure, because: “During the fast a Muslim feels and experiences what his needy and hungry brothers and sisters feel, who are forced to go without food and drink for many days – as occurs today to many of the Muslims in Africa.”  Indeed, the unity of the Muslims – and their aiding and assisting one another – is one of the great fundamentals upon which the Religion of Islaam is built, as Allaah – the Most High -said: “And hold fast altogether to the rope of Allaah and do not be divided.” [Soorah aal-‘ʿImraan 3:103]. Allaah – the Most High – also said: “The Believers – men and women – and friends and protectors to one another.” [Soorah al-Tawbah 9:44]. Thus, Ramaḍaan is a time to increase our sense of unity and brotherhood, and our commitment to Allaah and His Religion. And there is no doubt that this sense of unity necessitates that: “We all work together as required by Islaam as sincere brothers – not due to ḥizbiyyah (bigoted party spirit), nor sectarianism – in order to realize that which is of benefit to the Islamic Ummah and to establish the Islamic society that every Muslim aspires for so that the Sharee‘ah (Prescribed Law) of Allaah is applied upon His earth”  So we must examine ourselves during the month of Ramaḍaan and ask: What is my role? – and each of us has a role – in helping this precious Ummah to regain its honour, and return to the Ummah its comprehensive unity and strength, and victory that has been promised to it? Likewise, we should reflect upon our own character and actions and ask: Are they aiding the process of unity and brotherhood, or are they a harm and a hindrance to it? So we ask Allaah to grant us the ability to change ourselves for the better, during this blessed month, and not to be of those who are prevented from His Mercy and forgiveness. Indeed He is the One who Hears and He is the One to Respond. Ṣaḥeeḥ: Related by al-Bukhaaree (1/48) and Muslim (no.16), from Ibn ʿUmar (raḍee Allaahu ‘anhu). Ṣaḥeeḥ: Related by Soorah al-Nisaaʾ’ee (no.1992), from Aboo Hurayrah (raḍee Allaahu ‘anhu). It was authenticated by Shaykh al-Albaanee in Takhreejul-Mishkaat (no.1962). Related by Ibn al-Mubaarak in Kitaabuz-Zuhd (p.473) and Ibn Abee Shaybah in his Kitaabul-eemaan (no.99). Ḥasan: Related by Aḥmad (3/241), from Jaabir (raḍee Allaahu ‘anhu). It was authenticated by Shaykh al-Albaanee in Ṣaḥeeḥut-Targheeb (no.970). Ṣaḥeeḥ: Related by al-Bukhaaree (11/48I). from Aboo Hurayrah (raḍee Allaahu ‘anhu). Ṣaḥeeḥ: Related by Aḥmad (2/246) and al-Bayḥaqee (4/204), from Aboo Hurayrah (raḍee Allaahu ‘anhu). It was authenticated by Shaykh ʿAlee Ḥasan al-Ḥalabee in Ṣifat-Sawmin-Nabee (p.24). Zaadul-Ma‘aad (2/87) of Ibn al-Qayyim. Related by Ibn al-Qayyim in Madaarijus-Saalikeen (2/152). Related by Aḥmad (2/163) and Soorah al-Nisaaʾ’ee (1/327), from Aboo Hurayrah. It was authenticated by al-Albaanee in Irwá’ul-Ghaleel (4/99). At-Tamheed (19/61) of al-Ḥaafiẓ Ibn ʿAbd al-Barr. Ṣaḥeeḥ: Related by al-Bukhaaree (123) and Muslim (no.123), from Ibn Masʿood (raḍee Allaahu ‘anhu). Ṣaḥeeḥ: Related by Aḥmad (1/203) and at-Ṭabaraanee in al-Kabeer (11/100), from Ibn ʿAbbaas (raḍee Allaahu ‘anhu). It was authenticated by Shaykh Saleem al-Hilaalee in as-Sabrul-Jameel (p.43). Ṣaḥeeḥ: Related by al-Bukhaaree (4/99), from Aboo Hurayrah (raḍee Allaahu ‘anhu). Ṣaḥeeḥ: Related by Ibn Khuzaymah (no.1996) and al-Ḥaakim (1/130) who authenticated it. Refer to Ṣaḥeeḥut-Targheeb (no.1075). Related by al-Bukhaaree (I/53) and Muslim (no.40), from ‘Amr Ibn al-‘Aas (raḍee Allaahu ‘anhu). Ṣaḥeeḥ: Related by Aboo Daawood (no.4800) and al-Bayḥaqee (10/249), from Aboo Umaamah (raḍee Allaahu ‘anhu). It was authenticated by al-Albaanee in al-Ṣaḥihah (no.273). Ṣaḥeeḥ: Related by Aḥmad (2/441) and Ibn Maajah (I/539), from Aboo Hurayrah (raḍee Allaahu ‘anhu). It war authenticated in Ṣaḥeeḥut-Targheeb (no.1076). Ṣaḥeeḥ: Related by at Tirmidthee (no.693), from Aboo Hurayrah (raḍee Allaahu ‘anhu). It was authenticated by al-Albaanee in al-Ṣaḥihah (no.224). From the words of Shaykh ʿAbd al-ʿAzeez Ibn Baaz, as occurs in Majmoo‘ul-Fataawaa wal-Maqaalaatul Mutanawwi’ah (5/211). Al-Hisbah fil-Islaam (p.9) of Shaykh al-Islaam Ibn Taymeeyyah. Ṣaḥeeḥ: Related by al-Bukhaaree (2/109) and Muslim (no.650), from Ibn ʿUmar (raḍee Allaahu ‘anhu). Ṣaḥeeḥ: Related by Muslim (no.339), from Aboo Hurayrah (raḍee Allaahu ‘anhu). Ḥasan: Related by Aboo Daawood (no.3764), from Wahshee Ibn Harb (raḍee Allaahu ‘anhu). It was authenticated by al-Ḥaafiẓ al-ʿIraaqee in Takhreejul-Iḥyaa (2/4). Ṣaḥeeḥ: Related by Muslim (no.331), from Jaabir Ibn Samurah (raḍee Allaahu ‘anhu). Ṣaḥeeḥ: Related by Aboo Daawood (1/409) and Ibn Hibbaan (no.1664). Shaykh al-Albaanee authenticated in Takhreejul-Mishkaat (no.3914). Su’aal wal-Jawaab Hawla Fiqhil-Waaqi‘ (p.24) of Shaykh Naaṣir al-Deen al-Albaanee. As long as one is absolutely sure about the setting of the sun, he must not delay breaking his fast, as a delayed breaking of fast is the practice of Jews and Christians. Question: Should children below the age of fifteen be ordered to fast as in the case with prayer? Answer: Yes, children who have not yet reached the age of puberty should be ordered to fast if they are able to do it. This is what the Companions would do with their children. The scholars have stated that a guardian should order whichever youth he possesses guardianship over to fast so that they could practice it and become attached to it, and so that the foundations of Islaam could become instilled in their souls to the point that it becomes like second-nature to them. However, they are not required to fast if doing so will be difficult on them or bring harm to them. 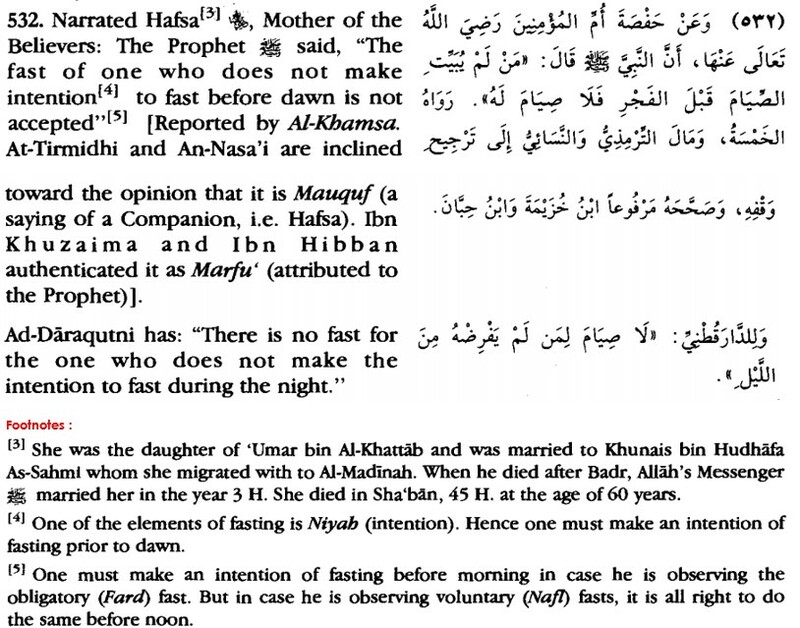 I would like to point out here an issue that some fathers or mothers do, and that is preventing their children from fasting, in direct opposition to what the Companions used to do. They claim that they are preventing their children from fasting out of mercy and compassion for them. But the reality is that mercy for one’s children is in ordering them to practice the rites of Islaam and to grow accustomed and attached to them. This without a doubt is from the best and most complete forms of raising and cultivating one’s children. That which is required for guardians with respect to those whom Allaah has given them authority over, such as family members and youth, is that they fear Allaah with regard to them and order them with what they were commanded to order them, such as implementing the rites of Islaam. Question: What is the ruling on fasting in Ramadaan when one does not pray? Answer: The one who fasts but does not pray, his fasting is of no use to him, nor will it be accepted from him, nor will it free him from his indebtedness (of prayer). In fact, fasting is not required on him so long as he does not pray. This is since one who does not pray is like a Jew and a Christian. So what do you think about a Jew or a Christian that fasts but yet remains upon his religion – is it accepted from him? No. Therefore, we say to this individual: “Repent to Allaah by praying, and (then) fast.” And whoever turns to Allaah in repentance, Allaah will accept his repentance.